The last week of September was all commuter rides punctuated by a Monday relief–a building collapsed in downtown Baltimore, and traffic was at a standstill. N., one of my shuttle buddies, texted me about it from an early shuttle, and I was relieved to learn no one had been hurt, and I could just hop on my bike and ride home instead of waiting for my turn in the wall of cars trying to get to MLK to take a left. Thursday I had the day off from work, though, and I spent in on my bike–all day long, 30+ miles worth of riding for fun and travel. I don’t usually ride with other people, but B. and I had been meaning to take a ride together for months, so when she offered to set the route, I said yes and marked it out on the calendar. I’m glad I did, not only because I got to enjoy her lovely company, but also because, after some zig zagging in ways I rarely zig zag, I ended up taking a right on Haven and a left on Eastern, under the freeway to Greektown before taking another left into the hospital at Bayview and through a neighborhood I had never visited–Joseph Lee, in Bayview. This is one of those neighborhoods where you can tell a developer stepped in with a plan. All the homes are in perfect matching rows, and the streets are in alphabetical order. I snapped this picture at the corner of Imla and Bank, but it could have been any corner in this block of homes. 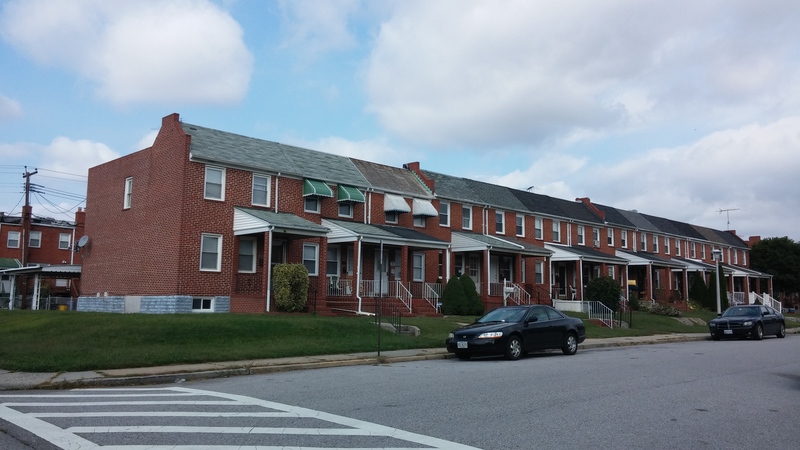 This land was part of Baltimore’s Canton Company’s purchase in the 1820s, but these homes were built between 1915-1950. 85% of residents there today are white, and I’m guessing that’s been true for a long time–patterns of desegregation and resegregation rarely find white folks moving into predominantly Black neighborhoods. That’s all I could find on Wikipedia about this neighborhood, but fortunately N.–my shuttle friend–is also my local history friend, and I’m pretty sure she’ll have more to tell me. After breakfast at the Broadway Diner by the Home Depot we rode back to my place, and I spent the rest of my riding day going to and from an appointment in Wyman Park and to and from A.’s house in Federal Hill where I got to hang out with a four month old who was all smiles and squirms until bedtime turned her into some other sort of creature. It was a good day of biking, but I’m not going to lie–by the time I hit the last couple miles up the hill again to home, I was ready to get out of that seat and rest a bit, which I did, until the next morning when it was time to commute by bike again. This entry was posted in bikes, neighborhoods and tagged Baltimore, Bayview, Canton Company, Federal Hill, Joseph Lee, Wyman Park. Bookmark the permalink. Getting some miles in, Kate. Strong is good.